Categories: Best Sellers, Fragrant, Most Popular. One of our best rebloomers, ‘Miss Amelia’ often blooms over 100 days a season in our area. 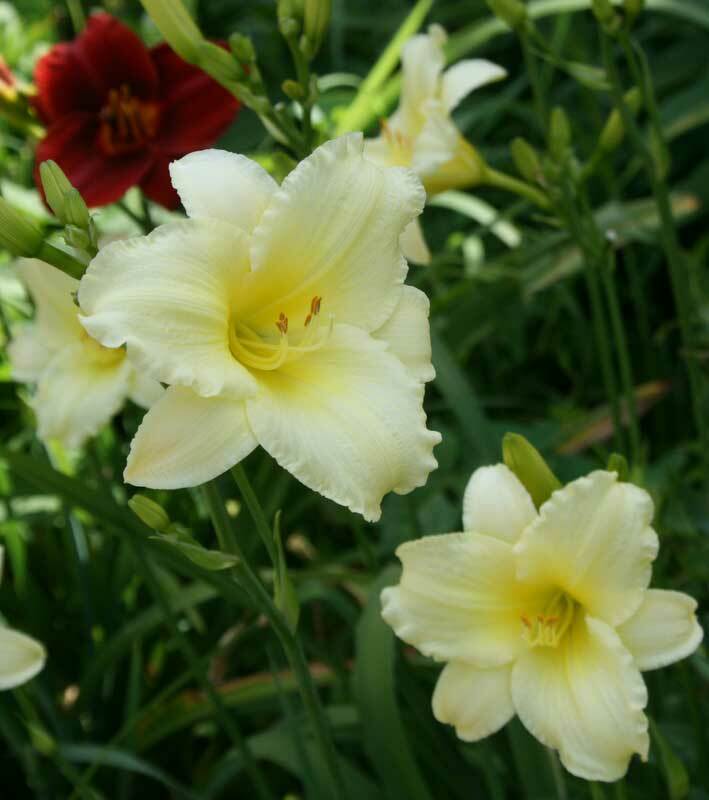 Very pale yellow blooms appear white from a distance. Fragrant. 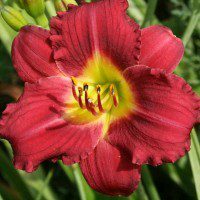 I purchased 3 “Miss Amelia” daylilies for a twilight garden. 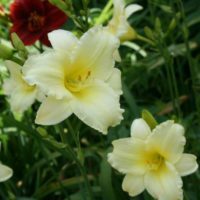 After reading some of the other reviews, and even viewing some of your photos, I was concerned that they may be more yellow than I wanted for my all white garden. 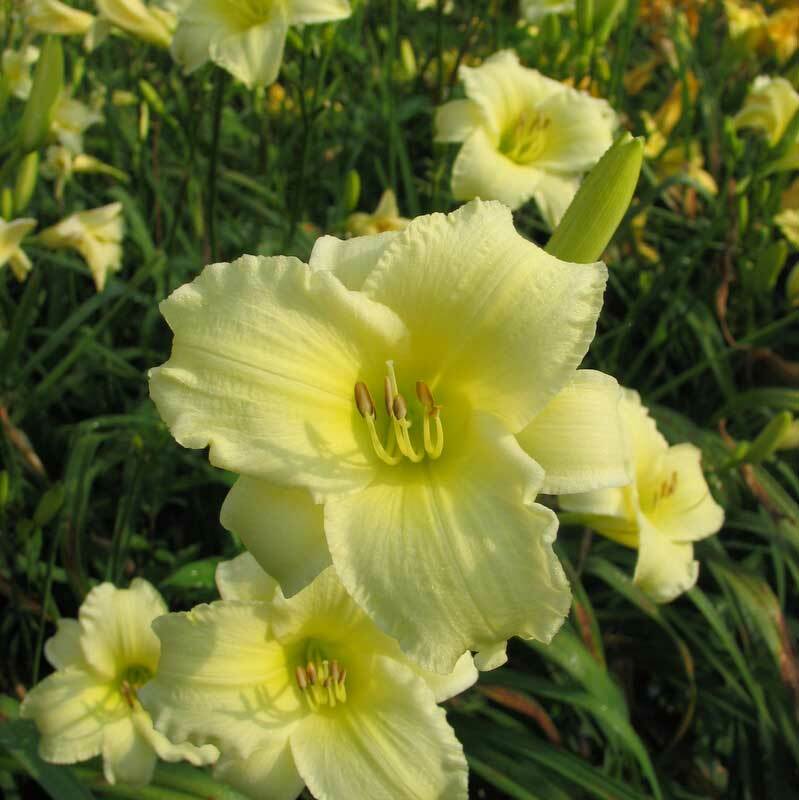 However, they are a lovely pale yellow color that can truly be called a near white. Beautiful flowers that show up nicely in the evening. I am very pleased with my choice. I put 5 of these in the front of a backyard garden. They begin to bloom in June (zone5b) and continue until the end of August. The greens are beautiful and the blooms spectacular. Highly recommend. My MIss Amelia day lily has already started bloomer and it’s early June in northern CA. I recommend this plant for any garden. I received a box of bare root plants two weeks ago — assorted kinds — and planted them just as the Alabama heat was hitting 95 every day. Yesterday, I noticed that Miss Amelia had put up a scape with three tiny buds. What a trooper. She’ll be the first in my Oakes lily bed to flower, and I didn’t have to wait a year. I’m rating this plant 4, for now, but that could change. I received and planted my daylilies about two months ago. Miss Amelia is supposed to be the tallest one. However, it is the shortest, with grassy leaves. It is going to be the first to bloom (it is supposed to be early) so at least that is right. It is about 6″ tall. There are three or four buds on it. PA-Zone 6a She’s a real charmer. I planted two last spring around a tree stump, along with a Dublin Elaine, and they bloomed in a few weeks (not so the Dublin Elaine) and even rebloomed this first season!! Not profusely, and didn’t get very tall just yet, but still such a sweet, delicate flower that i just ordered another one. 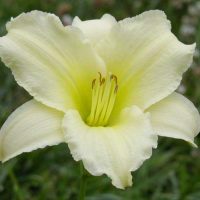 Such a soothing shade of a pastel yellow/ almost white that I would imagine she would blend beautifully with almost any perennial. Along with everyone else who wrote in, I’m a fan! Can’t wait for season 2! I planted Miss Amelia just three weeks ago, and one of the plants displayed two beautiful pale yellow blooms this morning on a single scape. Considering that it has been 100 degrees the last week, I am amazed! (I put the plants in a pot in partial shade until I can move them to their full-sun permanent location in the fall.) I’m looking forward to seeing more Miss Amelia blooms. Miss Amelia has been in the ground only a few weeks, and is blooming already. Really lovely. I chose the plant because I have a lovely grand daughter named Amelia, who just graduated from college. I am hoping that the plant will grow and become as special as my grand daughter is to me. Both Amelias are bright with priomise! Miss Amelia was one of the first daylillies planted in my garden and what a beauty she is. Love that pale yellow color. Within a couple of weeks of planting her she put up her first Scape. I can’t wait to see what she does this year. By happy chance I planted Amellia with Apricot Sparkles and Persian Market. The combination is truly lovely; the colors compliment one another beautifully, and the key to the combination is Miss Amelia, whose light yellow blossoms spark the arrangement. I could not have done better if I’d planned it that way. I’m giving Miss Amelia a 9, to leave room for a theoretical perfect daylily out there somewhere. This is our first summer with Miss Amelia. We planted them last fall. All are growing and blooming nicely for a first season. The bloom height for us is shorter than the 30″ described in the listing, but they may get taller once they are more established. Very lovely little pale yellow flowers that stand out in the garden bed. Because of the soft color, they may a nice transition between other flowers with contrasting or potentially clashing colors. This is a very striking daylily from a distance. There’s so many bold colors in my lily garden (yellows, reds, and oranges) that this near-white flower really shines through, even with its 3.5″ flowers. Love it. After planting in April it is blooming its little heart out. You will not be disappointed in the small flower as it really stands out. Just beautiful. 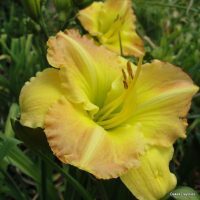 I currently have about 60 different varieties of daylilies and Miss Amelia is becoming one of my favorites. The leaves are short and the plant can be placed at the front of the bed, but the scapes are tall and hold the flowers about a foot over the plant so you can see through the scapes to what is behind. The scapes are strong and never need staking. Some daylily plants take up a lot of room, but this one is a neat little well-behaved plant and here in NC pretty much blooms on and off all summer long. 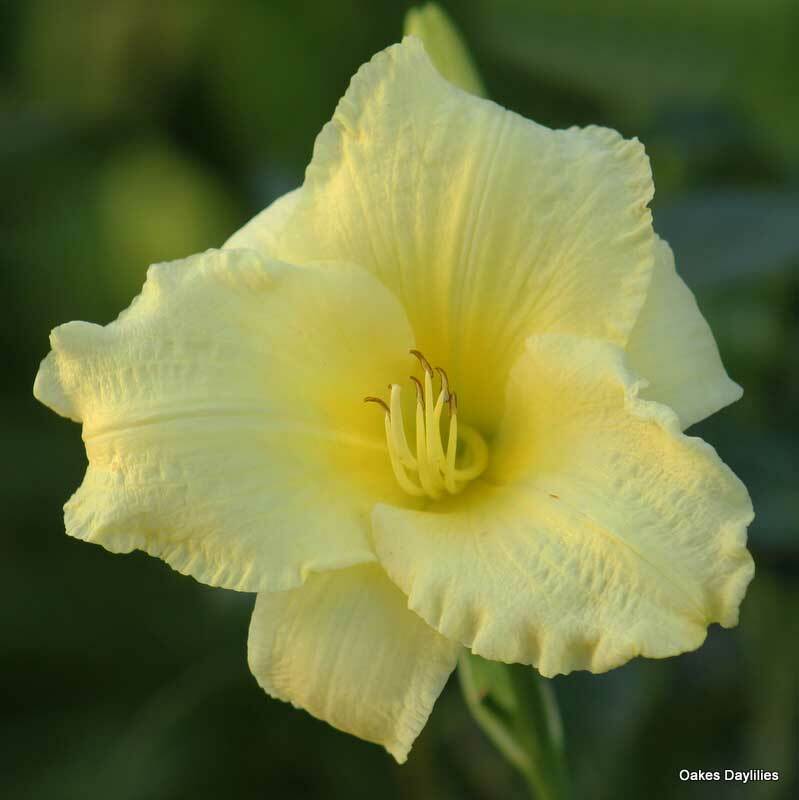 The color is a beautiful pale yellow that blends in well with all other garden plants. It’s a must-have! East Aurora, NY – I planted nine Miss Amelia at what turned out to be the beginning of a hot, dry, almost rain-free summer (well mulched with both newspaper and wood mulch). Two of the plants retreated underground — no above-ground leaves showing — but I kept watering them and all are flourishing and started to bloom in August. (The ones that retreated underground kept busy and sent up two clumps!) The flowers are a lovely creamy ivory with a deeper butter yellow throat and look both striking and restful beside the grape arbor against which they are planted. SO I ordered 24 more (it is a 40-foot bed) late August, put them in same way, and they are doing great. VERY satisfied with the quality of plants from Oakes! Lovely delicate pale yellow, almost white. Such a reliable rebloomer, and with such hefty fans from Oakes, they took right off. I put them in the ground on May 10 and they bloomed like crazy the first year. Delightful! I received a miss amelia last month it is blooming now, has little foliage but 3 scapes with 6 buds each. Definitely a “near white” from a distance and constant bloomer. Planted in a circle bed with gardenias and Delaware white azalea. Be sure to plant several for a good sweep since she has such a delicate flower. I consider her as prolific as Happy Return. Awesome daylily, bloomed practically all summer. I have a number of them growing in tall fescue on a hillside, and they really stand out! 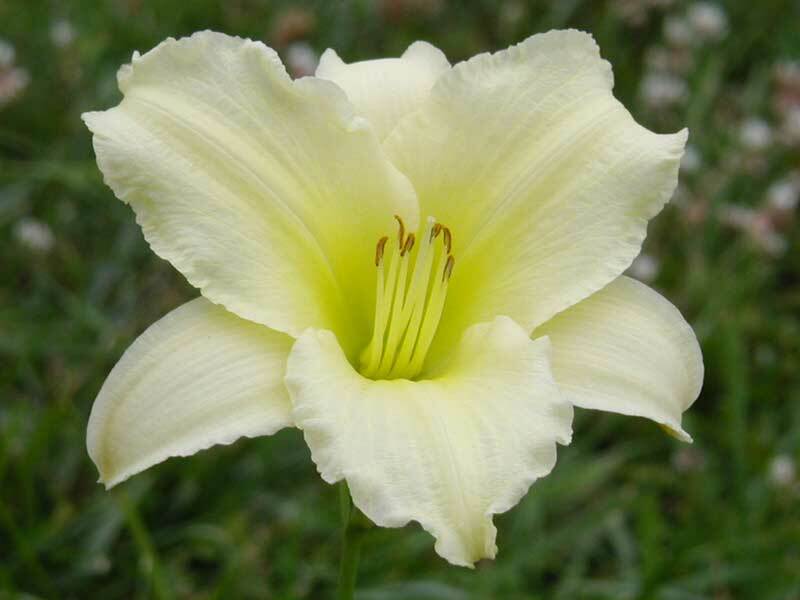 Love the color, creamy pale, pale yellow. I need more of these! Talk about flower power! My Miss Amelias (planted last fall) have been blooming NON-STOP for just over 10 weeks now. Yes, the flowers are on the smallish side and are definitely a pale lemon yellow (not “near white from a distance,” at least not in my garden), but they are delicate and adorable and they just don’t stop. I would say it’s best to plant these in beds where they can be seen and appreciated up close, not from far away. Very happy that I got to see this charming pale yellow little beauty just about a month after being planted in July. It is steamy hot in MS this time of year so it’s exciting to see a daylily blooming even a few at a time. Also, it looks good as a border plant. I think a need a few more! I bought MISS AMELIA intending to make her part of an all-white-blooming moon garden. The first week she bloomed for me I was sorely disappointed because she is NOT WHITE. Not even close. She’s so beautiful, though, that I changed my landscaping plans to fit her in. Three years and many, many daylilies later, she is still my favorite and looks lovely in my very-pale-yellow-blooming garden. She is especially lovely nestled in the deep shade in the heat of the afternoon. Lots, lots LOTS of flowers on this one. The flowers are small, but they bloom on high scapes, so they really make a great display in the garden. My only disappointment with this one is the color. They’re a beautiful pale yellow, but it takes more imagination than I’ve got to call them anything close to “white”. Miss Amelia is my very best rebloomer. I have 12 clumps planted in front of 9 clumps of Barbary Corsair, and they look great together – that’s a lot of flower power! The price is right on Miss Amelia, too! Reliable bloomer with many flowers. Colors hold true. A good landscape lily for the price. 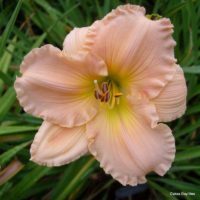 I brought this daylily with me to a new home this past fall. I have a granddaughter named Amelia, so I just couldn’t leave this one behind. I never got around to getting it in the ground, so it has stayed in a container since mid-summer ’07. Even so, it was the first daylily to bloom for me this spring, and here at the end of June it is still blooming, with several more buds waiting their turn. Delicate, pale yellow … beautiful! 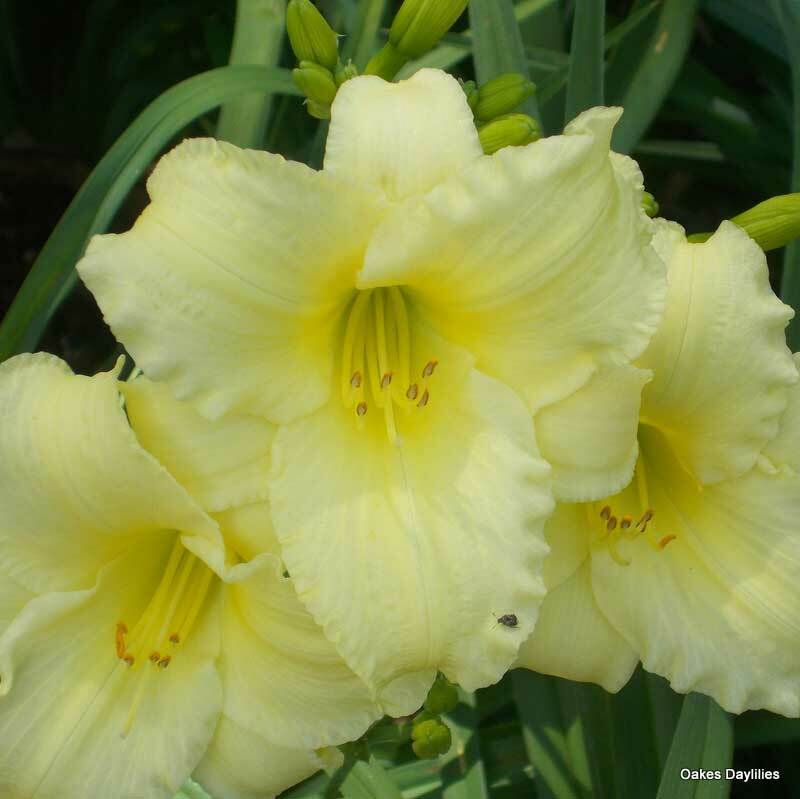 Another we ordered last spring that rewarded with many beautiful very pale yellowish green blooms. 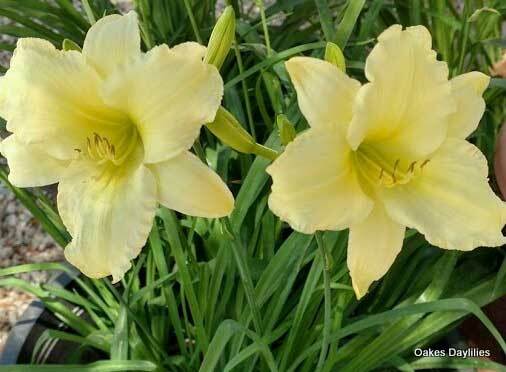 This one really stands out despite being less bold in color, as it complements all the daylilies we have around it. Really do like the little jewel. I planted three ‘Miss Amelia’ this June after leaving them in my garage in bareroot form for a few weeks. I worried about them surviving after being dried out. Much to my suprise, after three weeks, I had a nice butter colored bloom on one of the plants and a few more blooms yet to open. I am getting the impression this is a very stout and well performing daylily. Very satisfied! I just planted this daylily in mid-April, in a new bed in full sun. It started blooming in late May with loads of pale greenish-yellow blooms that are mildly fragrant. Gorgeous plant! This is the first year for Miss Amelia in my garden and she is blooming in spite of shabby treatment. I planted her in too much shade and then moved her after several weeks at the wrong time of year. She is a delicate looking plant that is a survivor. I am enjoying her delicate flowers. Received Miss Amelia last July during a heat wave. All plants bloomed and thrived. They all came back strong this spring. The plants are definitely larger. 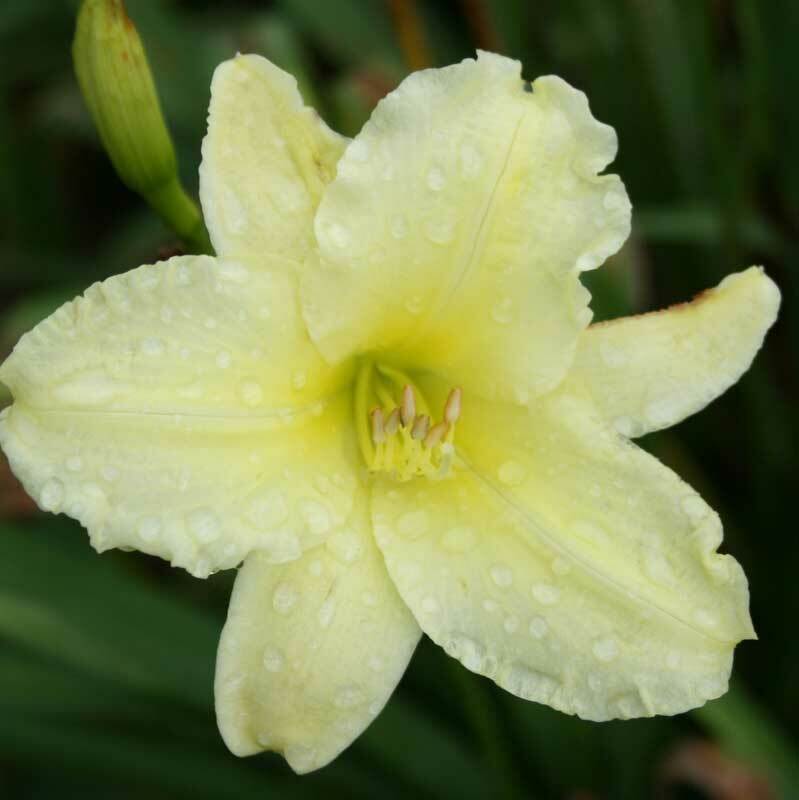 This daylily is absolutely beautiful—sweet, soft color and very prolific, even as new plants. I love the way they shimmer in the summer evening and can hardly wait for them to bloom this year!!!! Nice looking plant but did not rebloom for me. It was gorgeous when in bloom but one of my first to finish. I grow Miss Amelia behind Happy Returns in an informal border in front of my house. The combination is wonderful, and Miss Amelia never seems to stop blooming. I highly recommend her as an addition to your garden. This is my favorite daylily out of the 32 that I grow. The color is almost like butter, very delicate but beautiful. This is a must have!! I had blooms on this within 2 weeks of planting them. I have had blooms nearly every day for the last two weeks and they are a beautiful shade of light yellow (in Illinois). I plan to buy a lot more of these! 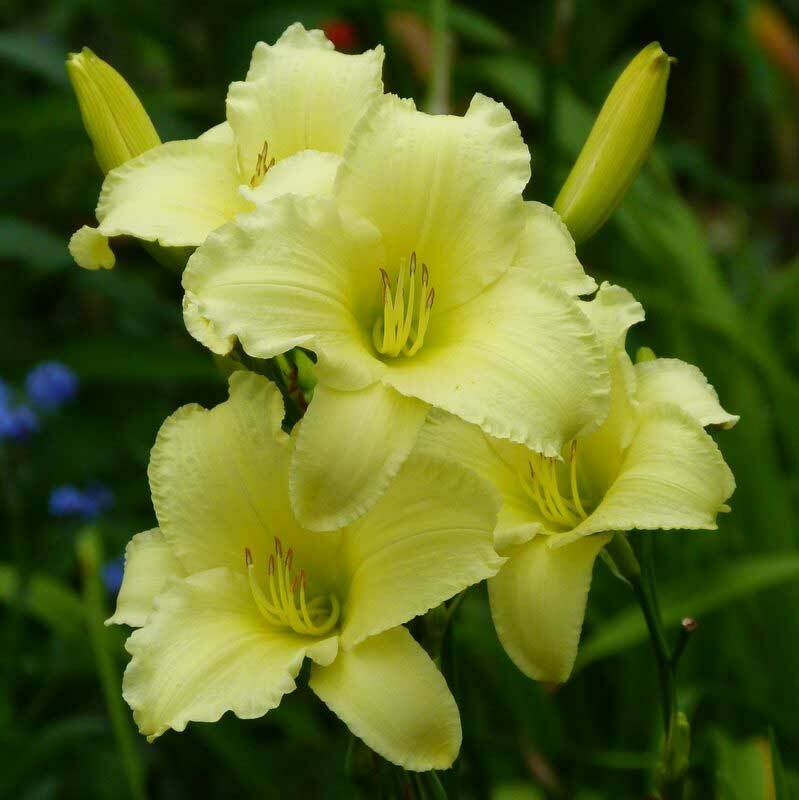 Absolutely charming little daylily. The booms are nearly white and the plant is tidy. Makes more of a statement than some of the large bloom plants. Excellent plant. I have had this plant for four years and it never ceases to please me. It is pale yellow, fragrant and delightful. I have about 20 plants on a hill, and neighbors all tell me how much they love my daylilies.